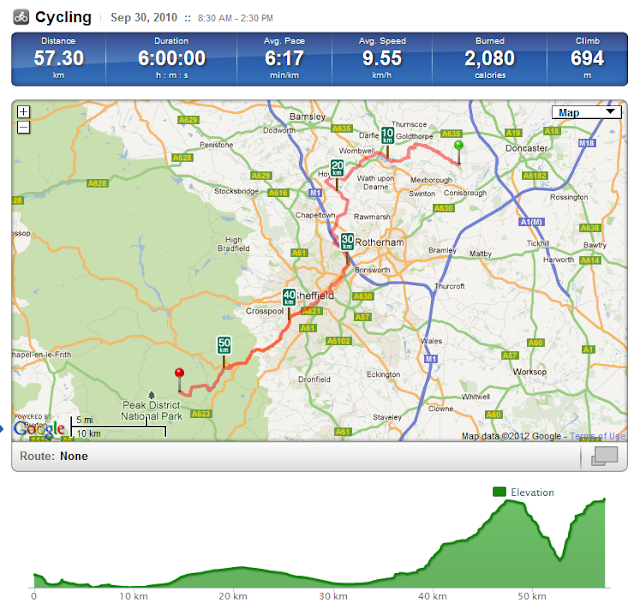 What a great day's weather I had and most of the route (even though it was fairly short) was traffic free. There was much to remind me of Yorkshire's mining and industrial past as well as a lot related to its flourishing industrial present. I followed in 62, 67 and 6 routes that brought me to Sheffield City Centre and then followed the main road out to Castleton and then took the spur off to Grindleford. Breakfast and the overnight at The Stables was as good quality and value as it was advertised and the clear blue sky was a very welcome change from the previous few days! I haven't looked to see what the areas were like previously but for much of the way to Sheffield the surrouding areas looks like they had been reclaimed from previous industrial use. Approaching the Elsecar Heritage Centre - home to many interesting industrials artifacts include a Newcomen beam engine used to pump water out of Elsecar New Colliery from 1795 until 1923, when is was replaced by electric pump. The cycle route up the quite steep 'Inclined Plane' whcih as the plaque explains was lain from Milton Ironworks to Elsecar Canal Basin - built c1840 and dismantled c1930 it transported 500 wagons a day. I assume it worked a little like a funicular railway with some wagons going up whilst other went down. Old weir and bridges on the approach into the heart of the Sheffield City. Many of the industrial units in this area were very much alive and working. Cycle routes abound in the Peak District and some traffic free ones in particular were drawn to my attention by my brother and family. The High Peak Trail from near Buxton to Cromford looks great if your going downhill and The Monsal Trail which from next year should enable people to travel the whole way along this disused rail line including the tunnelled sections. I did pass by the Monsal Viaduct last night once I had arrived in Hope Valley (although not by bike) and it looks like a fantastic route to take - on another visit!